The Who weren't always a nostalgia act or merely makers of pleasant Broadway fodder. Their tough, early tracks are a key punk resource, so it hardly matters that they were forever doomed to third place behind the Beatles and the Rolling Stones in the British-pop sweepstakes. At best, the Who's raw power and intelligence offered essential messages to any era. 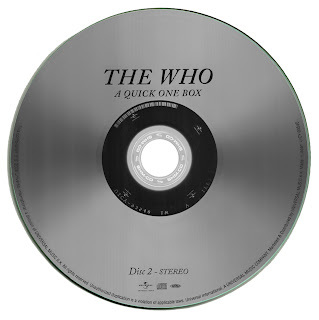 A Quick One is the second album by English rock band The Who, released in 1966. American record company executives at Decca Records released the album under the title Happy Jack, rather than the sexually suggestive title of the UK release, and due to "Happy Jack" being a top forty hit in the U.S. "Happy Jack" was not included on the UK version of the album, but instead was released as a non-album single. This is widely regarded by fans to have been a pivotal album for the group, due to the departure from the R&B / pop formula featured on the band's first release. Part of the marketing push for the album was a requirement that each band member should write at least two of the songs on it (although Roger Daltrey only wrote one), so this Who album is the least dominated by Pete Townshend's writing. The album was also the band's first foray into the form of rock opera, with "A Quick One, While He's Away", the title track of the LP, a nine-minute suite of song snippets telling a story of infidelity and reconciliation. The Who would later go on to write and record the full scale rock operas Tommy and Quadrophenia. The Who's second album is a less impressive outing than their debut, primarily because, at the urging of their managers, all four members penned original material (though Pete Townshend wrote more than anyone else). The pure adrenaline of My Generation also subsided somewhat as the band began to grapple with more complex melodic and lyrical themes, especially on the erratic mini-opera "A Quick One While He's Away". Still, there's some great madness on Keith Moon's instrumental "Cobwebs and Strange", and Townshend delivered some solid mod pop with "Run Run Run" and "So Sad About Us". John Entwistle was also revealed to be a writer of considerable talent (and a morbid bent) on "Whiskey Man" and "Boris the Spider". Excellent version of a classic record! Thank you very much, Marios. There are two similar japan double disc box sets of "my generatios" and "sell out". Any chance to upload them? many thanks in advance!! The album was intended to be pop music, a sonic participant in the pop art movement. The cover was designed by the pop art exponent Alan Aldridge, with the front cover depicting the band playing their instruments. 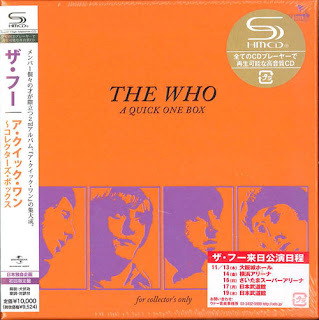 The back cover is a black-and-white photo montage of the band members accompanied by a short personality sketch of each (infamous among Who fans for Keith Moon's humorous assertion that he was keen on "breeding chickens"). A track listing, a couple of paragraphs touting the band, an ad for their first album, and a technical blurb are also crowded onto the back cover. In 2003, the album was ranked number 383 on Rolling Stone magazine's list of the 500 greatest albums of all time. Now it's OK. Thanks a lot Marios.